The essential quality of Mies’ metaphysics, as it is also true of the Spanish philosopher, José Ortega y Gasset, is characterized by his marriage of form and function. Mies found his artistic vision situated and framed by a sense of place and time. This enabled him to become realized as an architect from an early age. It is important to recognize that this aspect of Mies’ professional vision is a vital manifestation of vocation. In a similar vein, in The Modern Theme Ortega y Gasset attempts to build a bridge to serve as mediator between history and reason. Ortega’s contention is that vital-life takes primacy over the intellect, certainly over bloated over-intellectualizing. Mies understood himself as being at the crossroads of having to study, and even became influenced by the neo-classicism that he learned in the studio of his teacher, Peter Behrens, and the latter’s vision of uniting architecture with technology and industry. While industry demanded careful study of conditions that informed the world at the time, Mies nonetheless managed to incorporate his understanding of technology and industry in his aesthetic vision. The form of neo-classicism that Mies learned from Behrens was rooted in the fundamental architectonic principle of supplying universal solutions to questions of design. 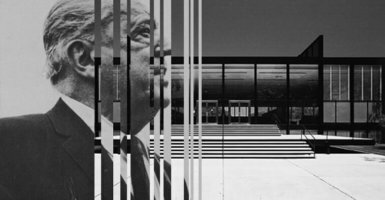 For Mies, architecture in those days faced the challenge of confronting structural problems with formal aesthetics. In 1919, Mies designed his last neo-classical house and then parted with neo-classicism, even though much later he would re-focus his attention on problems of this orientation. The philosophically interesting aspect of Mies’ work is that from the outset, he envisioned the architect’s responsibility in being mindful of the materials at his command. He first pondered this question when he asked himself, “What is a brick?” Mies viewed brick as the ontological basis of architecture. This allowed him a greater understanding of the function of steel, re-enforced concrete and glass panels. To Mies, architecture served a purpose in the modern world, much as it did in the Middle Ages: as a spiritual component of the time. Mies’ next task was to ask, “What is the great architectonic need of our time?” He recognized the importance of creating living-spaces for the masses. Mies coupled this with respect for individual freedom. This is indicative of Mies’ grasp of the pathos of twentieth century man. He argued that, while people had faith in God in the Middle Ages, and Cathedrals embodied this vision through the principles of verticality and the theological architectonic of light, modern man remains a spiritual wayfarer. Mies understood that public spaces bring people together. We encounter this in his use of austere, grand meeting places. While minimalism is not an essential characteristic of Mies’ buildings, it does help convey his aesthetic of space. Also, we must not forget that Mies is a rare example of a modern architect who placed great emphasis on the study of philosophy. Another aspect of Mies’ thought that can be favorably compared to Ortega’s is his concern for objective truth. Mies is known in architectural circles as an individual who did not waver from his convictions. He viewed logic as the great vehicle that delivers man to truth. To him, beauty is a vehicle for truth. However, logic and truth, according Mies, cannot be conceived as collectively contrived. This is one reason that Mies did very little to defend his ideas in public forums. Let us compare this with Ortega’s notion that philosophy has little to do with popular opinion. Ortega said that he did not find much philosophy in philosophy journals. Mies and Ortega embraced objective standards by engaging human reality. They both opted for simplicity in their work. Philosophical austerity in Ortega takes the form of vital reason. Vital reason is the form of reason that grounds life in human reality. Ortega points out that it is a mistake to allow pure reason to dictate the course of vital life. He argues that these two conditions are unnecessarily at odds with each other. For this reason, Ortega argued that vital reason serves as a system of checks and balances that safeguards man’s vitality. Ortega was concerned with the danger of misinterpreting vital, existential questions with technical knowledge. He viewed this as a disservice that the abuse of pure reason can exert on human existence. Mies thought of austerity as being a proper condition of aesthetics. For Ortega, austerity is an ontological concept, inasmuch as this has to do with coming to terms with existence-as-radical-reality. This discovery occurs because man cannot help but find himself existing in a given circumstance. Of all the entities that exist or can exist, Ortega argues that the “I” that I discover as the substructure of my existence is undoubtedly the most vital, that is, the most immediate. Besides austerity, Mies and Ortega also emphasize clarity in their thought. For Ortega, clarity is “the greatest courtesy that a thinker can bestow on his readers.” Equally important to Mies, clarity means the creation of vast spaces and lines that are not interrupted. Ortega utilized the space afforded him in newspapers to publish philosophical essays. Publishing in newspapers forced Ortega to discard intellectual embellishment. Mies’ notion that “less is more” can readily be applied to Ortega’s thought. One reason for this is that Ortega’s thought is rooted in pressing existential concerns. Unlike analytic thinkers, who find it necessary to scrutinize all forms of philosophical minutiae, seemingly ad infinitum, Ortega is concerned with the service that vital reason offers life. For Mies, the use of architectural space conveys the importance of form and purpose in his buildings. A good example of philosophical austerity is manifested in the recognition of human potential and limitation. Mies’ first creations were in wood, of which he knew very little. From 1905 to 1907, Mies was the apprentice of the best-known German furniture builder, Bruno Paul. Paul’s guidance facilitated Mies’ ability to work with wood. A central component of Mies’ professional trajectory is that his first job, in 1907, when he was twenty-one years of age, was to design a house for the philosopher, Alois Riehl. The house was constructed in Neubabelsberg, a suburb of Berlin. As a result of this meeting, Riehl had a lot of influence on Mies’ thought, given his many conversations with the young architect about philosophy and aesthetics. When Riehl saw Mies’ books, he asked the young architect, “Who advises you on your books?” Mies answered: “Nobody, I just started buying books to read them.” Mies explains that Riehl was dumbfounded that he had no logical order or direction to his reading. Riehl criticized what he considered to be Mies’ ill-disciplined reading habits. Reading, not unlike any other human endeavor, requires direction and perspicuity, Riehl suggested. Mies admitted that after this exchange he began to pay more attention to the books he read and the creation of thinkers. Mies is not opposed to technology in any of its manifestations. In reality, he saw the work of the architect as the inheritance of the ancient Greeks and the builders of the medieval cathedrals. In other words, Mies reiterates that the age of technology is not as new as some may think. Technology, for Mies, is essentially a form of development that, like neo-Platonism, comes to be known through the individual vision that eventually manifests itself as objective history. History comes about as the result of the inner dialectic waged on reality by the human spirit. Once again, we encounter the notion of discipline. What becomes manifested as a building or an idea presented in a book cannot do so without a backing-spirit from which it originates. This is what Ortega refers to as the significance of spiritual nobility. Mies adds: “The visible is only the final stage of historical form. Its fulfillment. Its true fulfillment. Then it breaks off. And a new world arises.” History is the manifestation of spirit inasmuch as what is measured and quantified. And, if quantification is the definitive pathos of our age, then, we must ask: What is the relationship between quality and quantity? This tension, then, is a good indicator of spirit in history. What we encounter in both of these thinkers is a critique of the limitations of pure reason. However, rather than offering a critique of intellectualism, Ortega and Mies offer a corrective, or what amounts to a qualification of reason. Reason, they suggest, is as easily abused as any other human faculty. Some of Mies’ detractors view his thought as an example of form following function. This hermeneutic confusion also exists in the mind of Ortega’s critics in respect to his ideas on perspectivism and objective truth. However, neither of these thinkers is an exponent of relativism. Mies’ notion of democratic architectural open spaces, and Ortega’s contrast between mass and noble man, originate in the notion of man as a tragic, cosmic being. We must reiterate the similarity of these two thinker’s ontological and axiological conceptions of man’s capacity for action. The similarities between Mies and Ortega’s aesthetics can be attributed in large part to the influence that spirit – Geist – plays in their thought. In several respects, we can argue that the form of modernism that both men practice is the indirect inheritance of Descartes, a thinker whose major themes include methodological discipline, the relationship between matter and form, and the supremacy of spirit over matter. Mies recognized, especially in the decades of the 1950s and 1960s, that the pretensions of post-modernism were nothing more than a dehumanization of art in wanting to create self-consciousness in artists. Post-modernism, which with the passage of time, has ushered a post-intelligible age, for its desire to promote obscurantism, is motivated more by anti-humanism than intellectual integrity. When Mies exclaimed that modernism needed to be anchored in the values of the past, he exposed himself to the ire of post-modernists, for whom the destruction of the past meant that thought does not have a fixed point where it can originate. Another interesting aspect of this criticism, which Ortega also alludes to, has to do with both men refusing to work from a theoretical – what Marxists refer to as a critical theory platform. The blind and fanatical acceptance of theory, Mies and Ortega contend, goes against vital life. Mies did not invent the glass building, given that Behrens and other members of the Bauhaus movement had already built some of these structures. He did contribute in creating buildings in which only glass is visible. If unity is a desired goal of architecture, then the glass building was for Mies its most visible expression. Mies attempted to bring order and clarity to a world that he viewed as dominated by the values of “das man,” or what is the mass man referred to by Ortega in The Revolt of the Masses. When Mies argued that “less is more,” what he had in mind was the growth of urban landscapes. Mies’ buildings are essentially windowless. While more traditional architecture was inspired by principles of light and shade, Mies viewed glass as a “reflective skin.” His buildings create a sense of levity. Lightness creates the impression of an eternal field of vision. The same is conveyed by the notion of beliefs in Ortega’s work. While ideas have to be verified and communicated, the nature of belief remains essential, in their infinite capacity to create a perspective that originates in vital life. Undoubtedly, in the realm of the vital and existential, our convictions are essentially what we rely on in order to live. Mies and Ortega were not proponents of reflective thought through committee. Current fashion has it that artists explain all artistic endeavor with theory. In many cases, theory obscures more than it is capable to clarify, Ortega argues. For him, theory is nothing more than another example of inauthenticity at work in modern man. Ortega’s critique of pure reason acts as an affirmation of vital-reason. According to him, post-modernism is synonymous with self-destructive relativism. This form of relativism attempts to destroy reason in order to supplant it with radical moral and political values. Relativism can also be viewed as a form of cynicism. In aesthetics, he tells us, cynicism is responsible for a lack of artistic vision. Ortega argues in The Modern Theme that individual perspective is possible because this is a portion of objective truth. Error, he explains, does not invalidate truth as being less vital, but rather that clear thought eventually delivers us to truth. 1. Peter Blake, Master Builders: Le Corbusier, Mies Van Der Rohe, Frank Lloyd Wright. (New York: W.W. Norton & Company, 1996), 169. 2. Blake, Master Builders, 169. 3. Phyllis Lambert, Mies in America. (New York: Harry N. Abrams, Inc., 2002). 4. Mies in America, 602. 10. Blake, Master Builders, 184. 12. Mies in America, 48. 14. Terence Riley y Barry Bergdoll, Mies in Berlin. (New York: The Museum of Modern Art, 2002), 366. 15. See: Jose Ortega y Gasset, The Revolt of the Masses and The Modern Theme. Pedro Blas Gonzalez is a Professor of Philosophy at Barry University. He is author of several books, the latest being Human Existence as Radical Reality: Ortega Y Gasset's Philosophy of Subjectivity (Paragon, 2005) and Ortega's "The Revolt of the Masses" and the Triumph of the New Man (Algora, 2007).